NANOSENSORS PPP-EFM AFM tips were used in the research for this article. Have a look at the abstract or follow the external link to the full article. Figure 1: Crystal structure and domains in boracites. Injection and controlled motion of conducting domain walls in improper ferroelectric Cu-Cl boracite. Nat. Commun. 8, 15105 doi: 10.1038/ncomms15105 (2017). 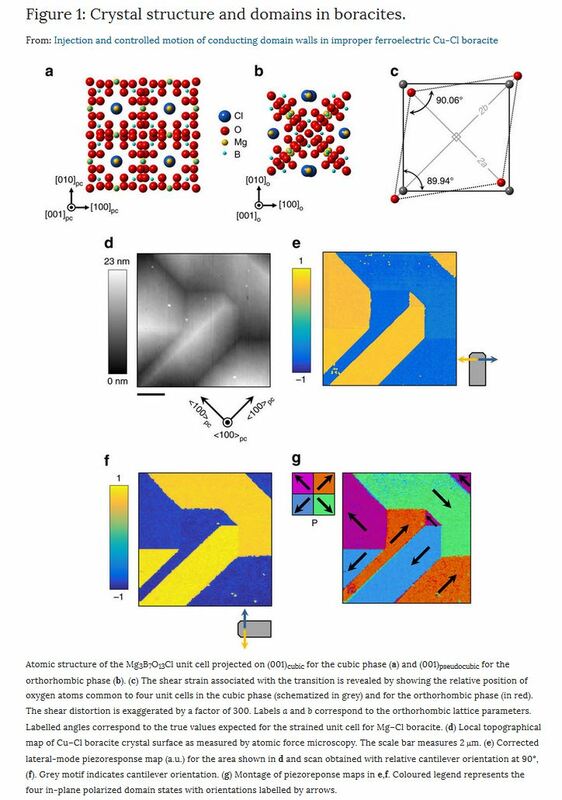 Ferroelectric domain walls constitute a completely new class of sheet-like functional material. Moreover, since domain walls are generally writable, erasable and mobile, they could be useful in functionally agile devices: for example, creating and moving conducting walls could make or break electrical connections in new forms of reconfigurable nanocircuitry. However, significant challenges exist: site-specific injection and annihilation of planar walls, which show robust conductivity, has not been easy to achieve. Here, we report the observation, mechanical writing and controlled movement of charged conducting domain walls in the improper-ferroelectric Cu3B7O13Cl. Walls are straight, tens of microns long and exist as a consequence of elastic compatibility conditions between specific domain pairs. We show that site-specific injection of conducting walls of up to hundreds of microns in length can be achieved through locally applied point-stress and, once created, that they can be moved and repositioned using applied electric fields.